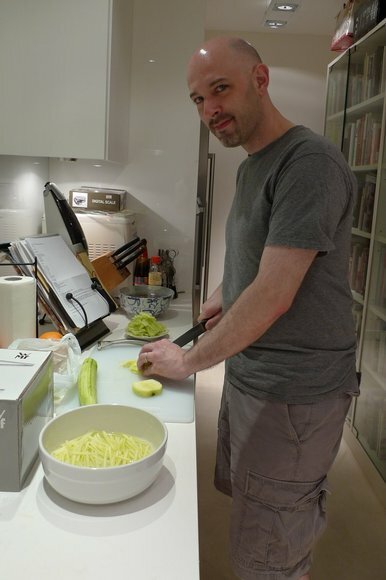 While in Hong Kong, I stayed with a friend I first met some fifteen years ago, also named Chris. He and his partner Antony are dear people, just wonderful to visit with. 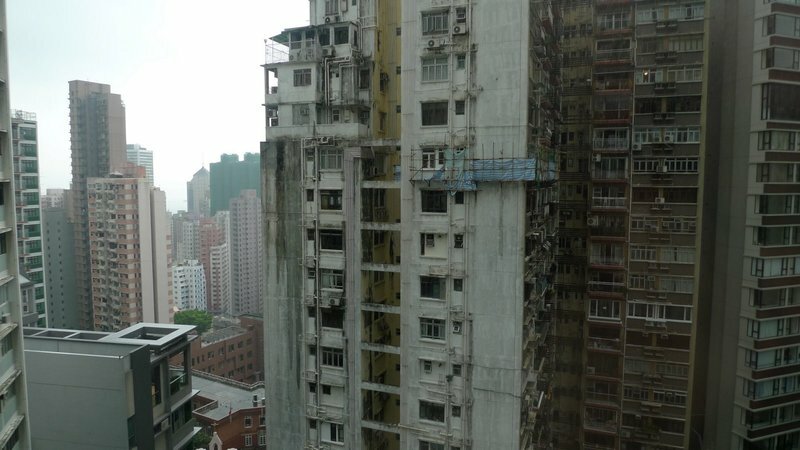 They also live in a gorgeous flat in the western Mid-Levels. Trying to be the best guest I could, I let them know that I looked forward to spending time with them but also didn’t want them to feel obligated to bend their schedule around my visit. One thing Chris insisted I must be a part of was a dinner party they were hosting on Saturday night. I’m glad I did as it was a lot of fun. I also got pulled in as sous chef since it was a public holiday and the maid had the day off. This is fine as I enjoy cooking and the opportunity to let someone else run the show is a good way for me to learn. First, though, back to the topic of bamboo scaffolding. Here’s a view from the guest bedroom. I noticed that some work was being done on a unit across the street, on about the twentieth story of the building. 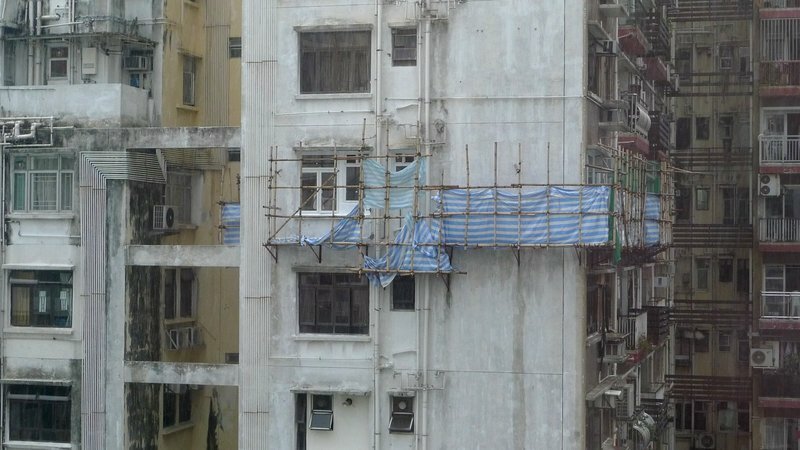 Notice how the bamboo scaffolding seems rather… rickety? But it seems to be the safest way to get the exterior work done. I’m curious how it is actually attached to the walls, though. 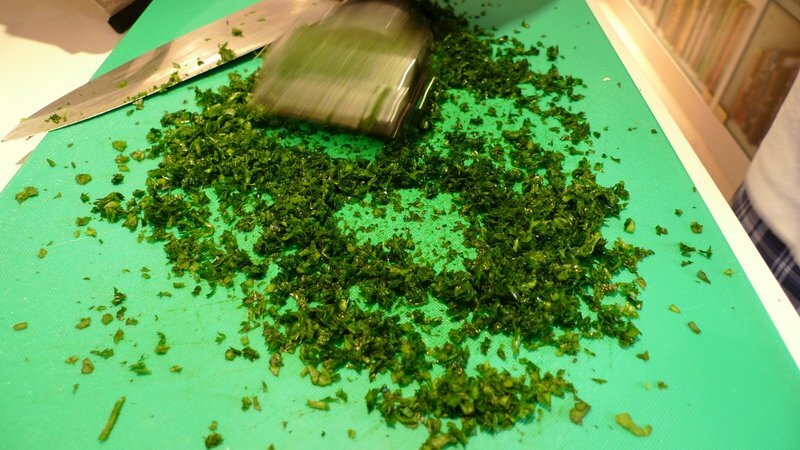 Chopping herbs, a combination of cilantro and Italian (wide leaf) parsley. The little roller device was kind of a mess and I think just using the chef’s knife would have been easier. Mix all that with a hefty amount of freshly-ground black pepper. Slice really good quality tuna into batons about 1 inch (3 cm) square. Coat the batons with the herb-pepper mixture. Here Chris is doing the coating while I take pictures. Notice the huge library of cookbooks in the back. 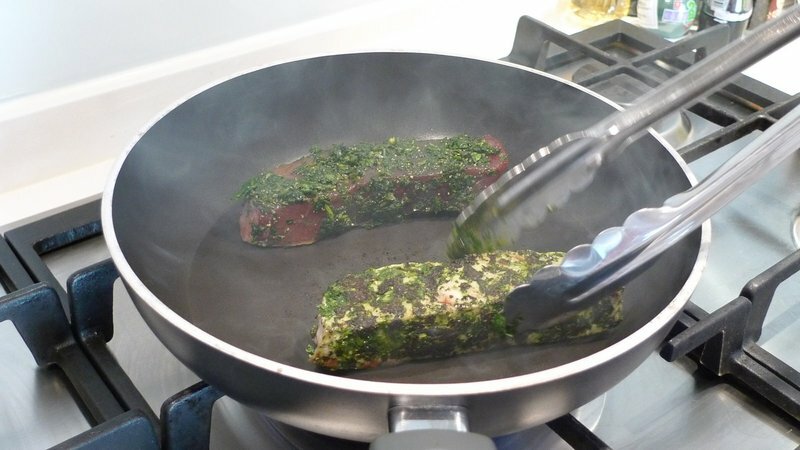 Sear the tuna in a hot pan for exactly 30 seconds on each side. The goal is to have the interior cooked like this, still pink. These were lovely. I’m pressed into service slicing apples and cucumbers into matchsticks which are then soaked in a very lightly salted water bath. These were served as a light salad to cleanse the palate before the main course. Very nice idea, although I think it needs some color. That would add flavor, though, which isn’t the idea. 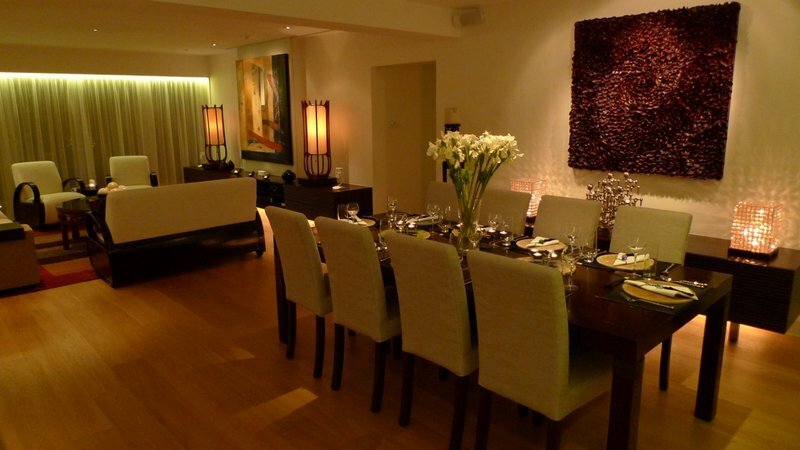 Dining room and living room ready for the guests to arrive. Beautiful, isn’t it? The antithesis of the style Tawn and I did our home in and I quite like it. Very modern but still with an Asian undertone. Antony did the amuse-bouche, super easy but really complex in flavor. 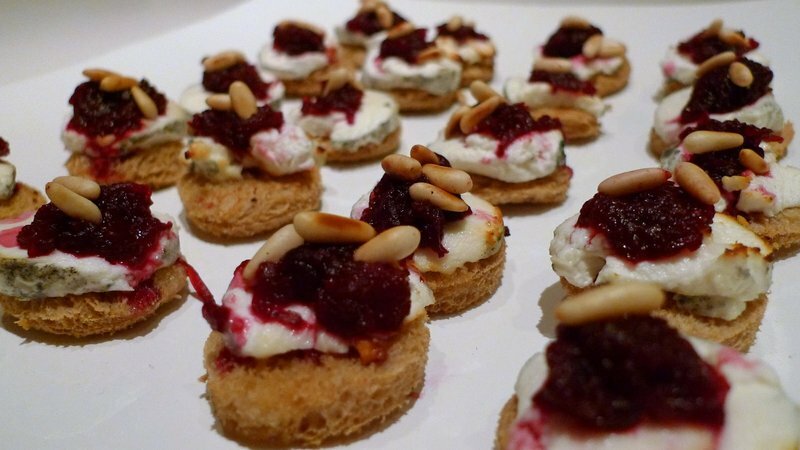 Toasted whole grain bread circles topped with goat cheese, shredded baked beet root, and a few toasted pine nuts. Bake in the oven for just a few minutes until the cheese gets soft and creamy. The appetizer course. 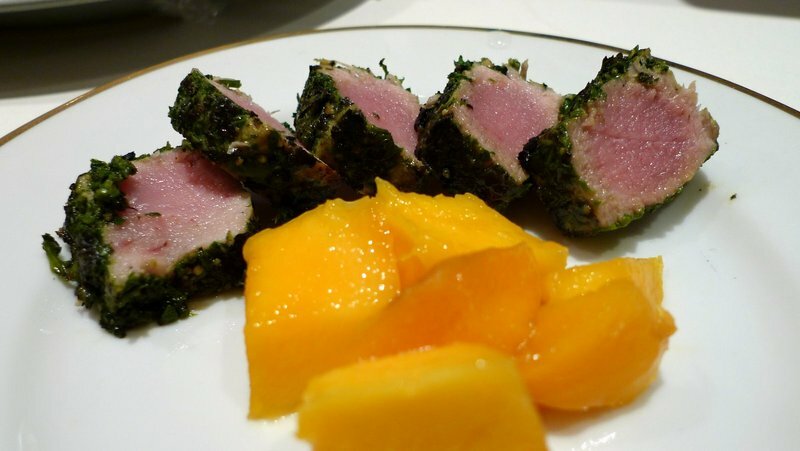 The tuna batons served with some pieces of fresh mango. So simple, so good. The main course would have benefitted from some advance work as it took almost thirty minutes for the two Chrises to pull this together as the guests chatted. Slices of salmon with a egg white and soy sauce mixture brushed on the skin side, which is then crusted with toasted sesame seeds and then pan fried. 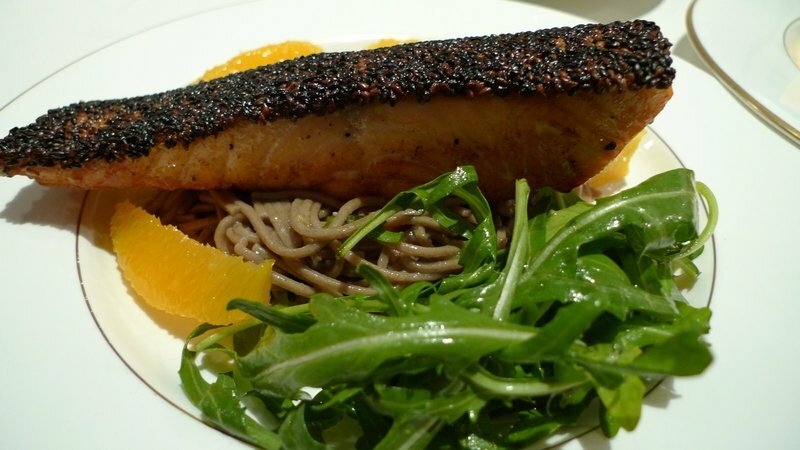 The salmon is then served over cold soba noodles with some citrus slices and a small rocket salad. Very nice and I’ve recreated this at home since returning. I think this needs to be something that you sear in advance and then maybe finish in a low oven, that way you don’t smell smoky while your guests are here. I’ll work on that. 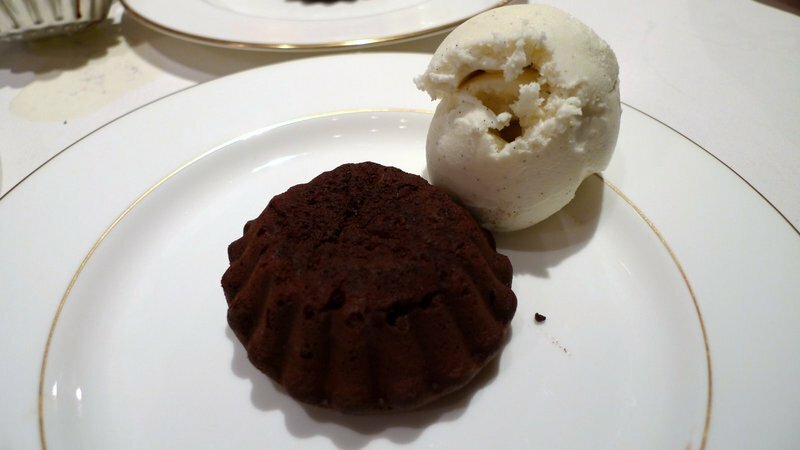 For dessert, little molten chocolate cakes served with vanilla bean ice cream. A bit rushed as two of the guests had to head to the airport, but very nice nonetheless. As we neared midnight, fueled by two bottles of champagne and several bottles of wine, the guests became more animated. One of them who has a history of performing in drag, decided to give us an impromptu runway show set to Lady Gaga’s “Poker Face”. Since his identity isn’t clear in the video, I guess it will be safe to share it with you here. Notice the disco lights. Would you believe Chris and Antony had these built into their kitchen bar area? They are hidden under the seating area. Handy to have at such an event! 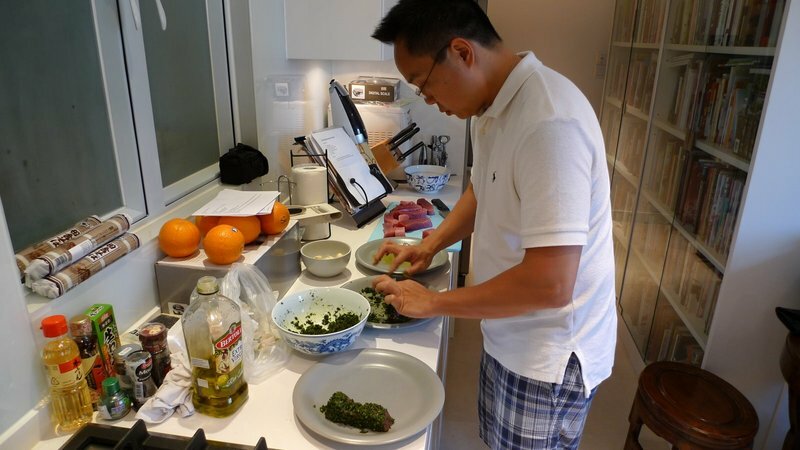 This entry was posted in Uncategorized and tagged cooking, Dinner Party, food, hong kong, Lady Gaga, Salmon, Tuna by christao408. Bookmark the permalink. Your hosts do have colourful friends indeed! I think the courses of food being served are just lovely! 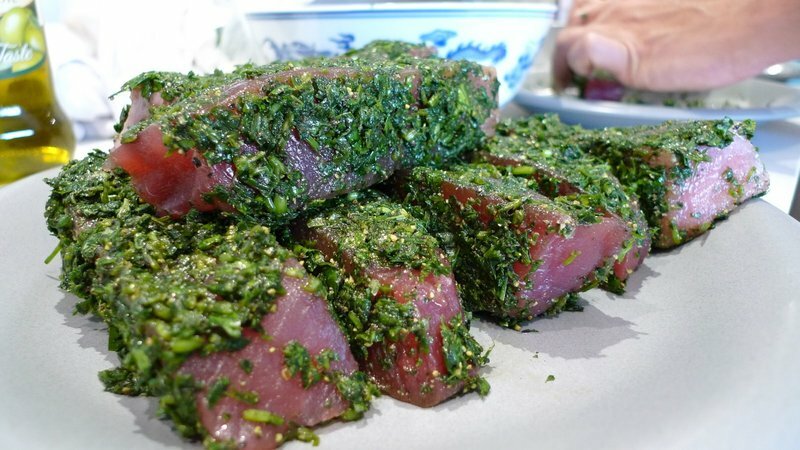 Guess I’ll cook up some tuna at home as well, very delicious! this is epic! what a dinner party!!! food looks uber delish as always – YUM!!! !ps love da video clip as usual…..
what a lovely dinner, good place, very good food, and such a professional entertainer…! Such a beautiful condo. I am going to email this to Saadia. She loves tuna and salmon. I think she will like this very much. The goat cheese on the toasted breads circles, has some greenish stuff in it in a couple of them. Did you mix some of the cilantro mixture to the cheese? It looks exquisitely ravishing. What a great idea. I’m having heart palpitations just looking at that scaffolding! That looks so dangerous.The food looks amazing. My favorite probably would have been the amuse bouche with the goat cheese (but of course). not being a big fan of fish could you use chicken instead? Gosh that light salad of apples and cucumbers looks heavenly! I am so going to do that. It all looks so good! Can I do that too?If I invited you over for dinner, could I put you to work? food looks fabulous; entertainment – sadly – not so much. Poor sod. @ZSA_MD – I think the log of goat cheese Antony used was one covered in either herbs or ash, so that may explain what appear to be green flecks. @Ikwa – My tought is that chicken wouldn’t work so well with these recipes because of the way they are cooked – high heat sear on the exterior, rare on the interior. Definitely something you don’t want with chicken. The concept would work better with beef but I’m not sure either of the coatings goes all that well with beef. @Passionflwr86 – “Colorful” is a handy adjective. 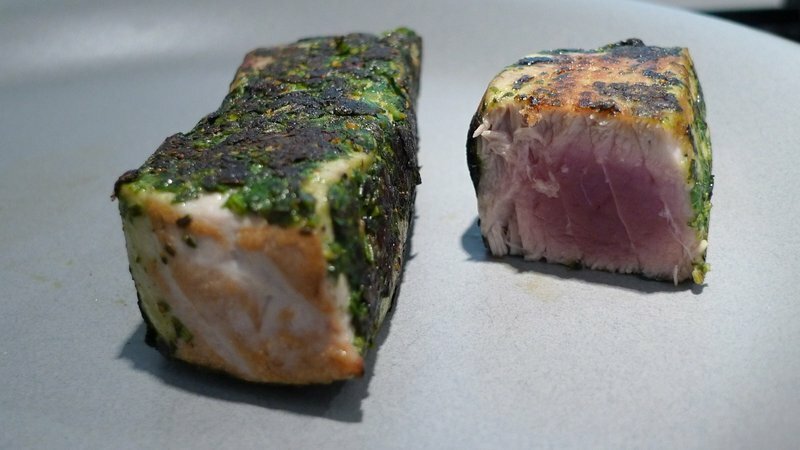 =D@CurryPuffy – Seared tuna is really easy and is always impressive, so long as you have good quality tuna to begin with. 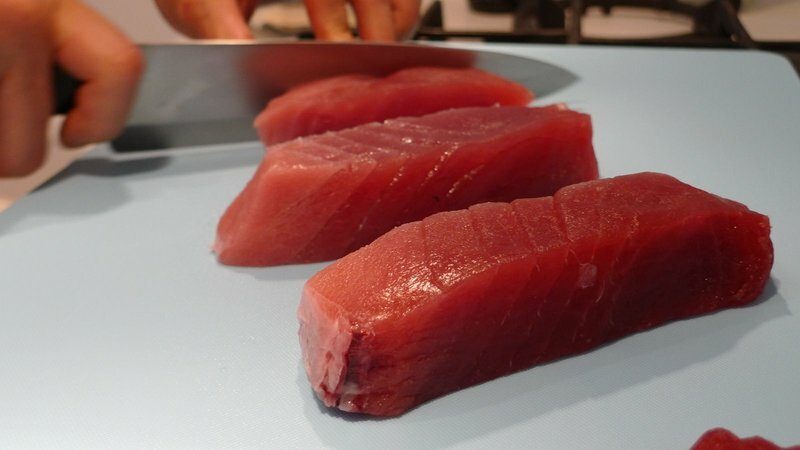 Thankfully, sushi grade tuna is widely available in Hong Kong and Bangkok. @Sinful_Sundae – “Epic” – I’ll have to pass that along to Chris and Antony. @agmhkg – It really was a fun evening. @kunhuo42 – I should ask more about the thought process around the disco lights. What conversation were they having with their electrician when they discussed the installation of multi-colored LEDs hidden under the counter with a variety of settings on a control panel in the hall closet? What unmet need in the past brought that up? “Honey, whatever we do, in the next house we’re going to have disco lights!”@Fatcat723 – Memories, huh? @TheCheshireGrins – Such a simple idea, I’m going to have to try it. Conveniently, in Hong Kong, you can buy precooked beets in a vacuum sealed bag, so you don’t have to cook them. Different than the canned ones, which are pickled I think. @Wangium – Jason, it would be a privilege and an honor to serve as your sous chef. @AppsScraps – But he seems to be enjoying himself so very much! i liked what you guys did with the seared tuna and mango. i thought about it and the dish must taste amazing. even looks-wise, it looks greatas for your profile picture, i’d say go for it. i just switched over to a new one today and strangely, my blog feels like it’s new. Love the food photos!! And that scaffolding looks down right dangerous – especially 20 floors up! yikes! Disco lights! Plueeezze! I had to suffer through the 70s and I can’t handle the lights or polyesther pastel suits for men. @murisopsis – Thankfully, no polysether pastel suits were used in the making of this video. @christao408 – LMAO! actually, if that’s the case, then one of those graphs might serve as a better profile picture! haha! OMG that is one beautiful flat!!!! =) JEALOUS!! @lil_squirrel4ever – It is really, really beautiful and even more amazing when you see the “before” pictures. @Swiftonik – Thanks. Lumix LX3, a nifty point and shoot with full manual control and a 22mm Leica lens. Excellent optics and fantastic low light performance. I love your friend’s apartment and wish I had their design sensibilities and taste. I didn’t really pay attention to the dancer in the video but just let my eyes danced all over their unit. And how do they keep their stove so clean? @ElusiveWords – Their design aesthetic is very nice, modern Asian. Very clean. The stove being so clean? They have a maid! Looks great! Love the decor!! !